More fun with fabric stiffener. Here's how to make some easy fabric picture frames for your wall. Or cut out anything your heart desires: silhouettes of your family, animal shapes for the nursery, lettering, ornate designs, party decorations... the world is your oyster. Hey, maybe consider doing an oyster. I'd heard of people ironing starched fabric to walls and wanted to try it out. Sure enough, I was able to stick my stiffened fabric to the wall with an iron and remove it without harming my paint job. This is super for renters, indecisive decorators, or easily bored people. Note that if your wall is really rough, you'll probably have a hard time making these stick. Also for what it's worth, my walls are painted with flat latex paint. Prepare a piece of fabric with fabric stiffener. See this post where I used Stiffen Stuff in a spray bottle. Measure your photo and determine the size of the opening needed in the picture frame. I used 5x7 photos, so I wanted to overlap the photo by 1/4" inch on every side. Thus the hole in my fabric needed to be 4 1/2" x 6 1/2". 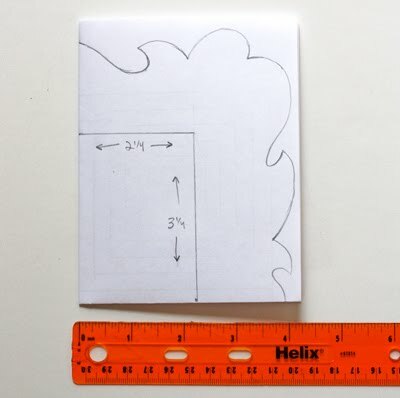 To make a template for your frame, fold a piece of scrap paper into quarters. 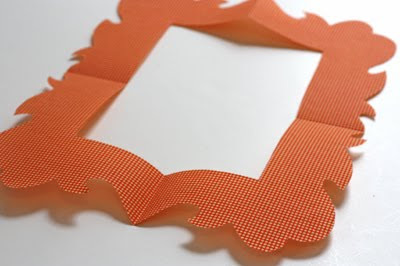 You can design one quadrant of the frame and cut through the layers to make a symmetrical border. Mark off one quarter of your frame opening (in my case, 2 1/4" x 3 1/4"). Then sketch a decorative border for the frame. Cut out the paper frame and unfold to see if you like it, confirming the opening fits over your photo. 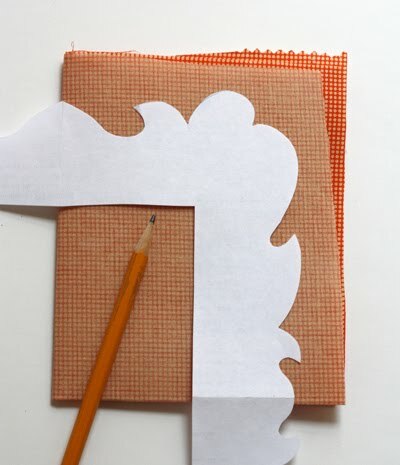 If you're happy, fold the pre-stiffened fabric into quarters and trace your design onto the back side with a pencil. Cut out the fabric frame and iron it flat to get rid of the fold marks. Then iron the fabric frame to the wall. I tried to be quick about it, not leaving the iron pressed against the wall for very long. I'm pleased to report that this didn't harm my paint at all. Some outer bits of the frame weren't sticking at first, so I used the point of the iron to go over those again until everything was adhered well. After the frame is ironed to the wall, loosen the edges around the picture opening with your fingernail until you've pulled enough loose to insert your photo. 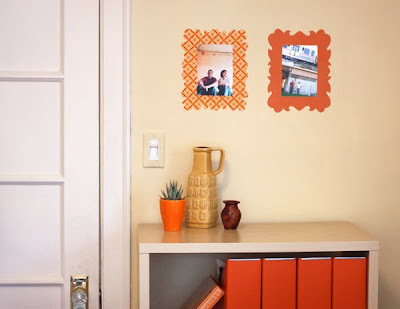 If too much comes loose, put the photo in and iron around it to stick the loose parts of the frame back to the wall. Later I tried peeling these frames off the wall and they didn't leave a mark. Lovely! Incredible! I'm going to try this out in my son's room and maybe for some party decorations too. Thanks! I love how you make these absolutely darling creative ideas look so doable. Thanks for all the great ideas you share. Love this one. This is FANTASTIC! I'm a renter, so I'm VERY excited to try this! Very cool. Reasonably priced and nice looking frames are so hard to find, especially if you have a lot of photos to put up. Can't wait to try this! So, just to be clear, the stiffener was enough to adhere it to the wall? You didn't have to use starch in addition to the stiffener? Very cool. Wow what a great idea, so fun & colourful. Will surely try this out myself & then let my readers know about you're amazing post. Thanks. Oh just one more question, are you aware at all how long they will stay stuck to the wall? Tiges, beats me. I'll report back when something falls off the wall. Wow, that's really crazy but so cool! Unfortunately, we have quite textured walls. How hot was your iron? Almost seems like your paint would scorch. Cotton setting, no steam. Pretty hot! I tried to be quick about it, though and not touch the wall very long. Brilliant idea!! I love it! You have such great ideas--and this one is brilliant. I love reading your blog. Thanks for sharing your awesome discoveries. This is a great tutorial. Thank you for sharing this fantastic idea! These are the loveliest! Thanks! That is pretty darn cool! great idea, and yours look great! i'm afraid if my husband came home and found me ironing things to the walls though, he might have me committed! I did a whole wall of fabric years ago with 'liquid starch'. I just dipped the fabric into the starch (that I poured into a bucket); swooshed it around, making sure its good and wet; then rang it out and applied with my hands. I used a damp sponge to smooth it out. It's a great project for boring walls! I'm not 100% sure I can actually do this, but I'll give it a try sometime soon. Thank you for the tutorial. Hi Stormy, did you use purchased liquid starch for your wall project, or make your own like I tried here? Just curious. what a GREAT idea.thanks for sharing. Love this trick - I used it to spell my daughters name with different fabrics in her nursery. I will say you have to be careful with how hot your iron is - I bubbled the paint in one small spot when I first started - oops! very cool stuff! wish i could try this but my walls are too rough. boo. I have been reading your blog for a while now and I just have to say.....You are so freaking awesome!! Jess - i used the stuff from the grocery store back then; but yours is a much better way to go! I love the orange design it looks good for summer season. Wish i could have those wall decals it's really lovely and refreshing. I am just LOVIN' this series of posts, I have flagged every one and can't wait to try each! Wow, you're going crazy with the stiffened fabric. Great ideas! Love it! Keep 'em coming!! :) Thank you!! Amazing tutorial!!! Can't wait to try it out! Tried this out tonight! Our toddler now has a nice little brown puppy and large brown tree w/ baby blue leaves decorating his wall! This is a wonderful idea, especially since we live in an apartment and can't paint the walls! Not quite a picture frame, but an awesome way to do room decals! What a great idea. So much better than getting a bunch of expensive frames! just one more reason I'm sick of textured walls!!! Great idea. You might try one of those mini irons to iron it on the wall as you iron very small areas. this is super cool! what a great idea, and so simple, too! Oi margarete, adorei a ideia e as dicas do PAP, valeu mesmo, bjs. That ROCKS!! I'm gonna have to try this! :) Thanks! But I was thinking, would starched fabric stick to a door? I think it's worth a try anyway. Now all I need is an iron, lol. Hi Anonymous, that door project uses starch, not Mod Podge. It's not permanent. Here's a similar project I did awhile back. There's a link in that post that's interesting, too. I'd do it if I was renting. Wondering... could I do this with the starch (mentioned by the above poster) instead of Stiffen Stuff? I have had trouble finding Stiffen Stuff at my craft store but really want to try this! I don't know what happens when you iron fabric to the wall that uses a dried water+cornstarch mixture. Guess you'll have to experiment! HI, I really want to try this on the back of my shelf’s that are boring. I didn't read through all the posts, but I was wondering if anyone has used this on oil paint? Mine is latex, but I'd imagine it would work fine. Has anyone tried using sta flo to stiffen the fabric for this project? SUPER COOL!. Way to take Fabric Wall Decals to a whole nother level!!!! Hi Jessica, Do you have templates for the frame designs? Any idea how I can get these? I don't have templates, I'm afraid. I just sketched the designs onto my paper. When it's folded into quadrants, you can be assured your frame will turn out symmetrical (kind of like cutting a snowflake.) I think you can do it! On a whim I tried this with Spray-on starch which you would use for ironing your clothes, but of course it didn't work (your clothes would stick to the ironing board, I imagine...). I'm not sure if I'll be able to find Stiffen Stuff here in Hawaii where I live, so I might just use your other cornstarch-no-heat tutorial. Do you have any pros and cons to which is better? Pros of the make-it-yourself paste: it's cheap and easy. For me it stuck really well. Cons: really bright fabric dyes might bleed onto the wall unless you're careful to wash it first and test the colorfastness. And the starch leaves a very thin film after you remove the fabric. Depending on how wipeable your paint finish is, it can wipe off. 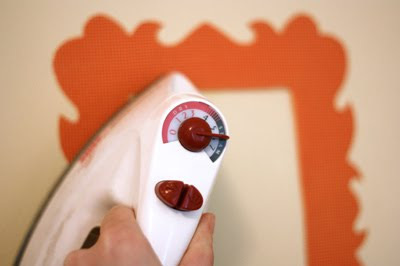 Stiffen stuff pros: no mess, easy to remove with no effect on your wall. (At least mine worked like that!) Cons: costs more. Could get cost prohibitive if you're doing huge pieces. Just wondering if it's still sticking to the wall, and how easy it was/is to remove after several years. Any update?